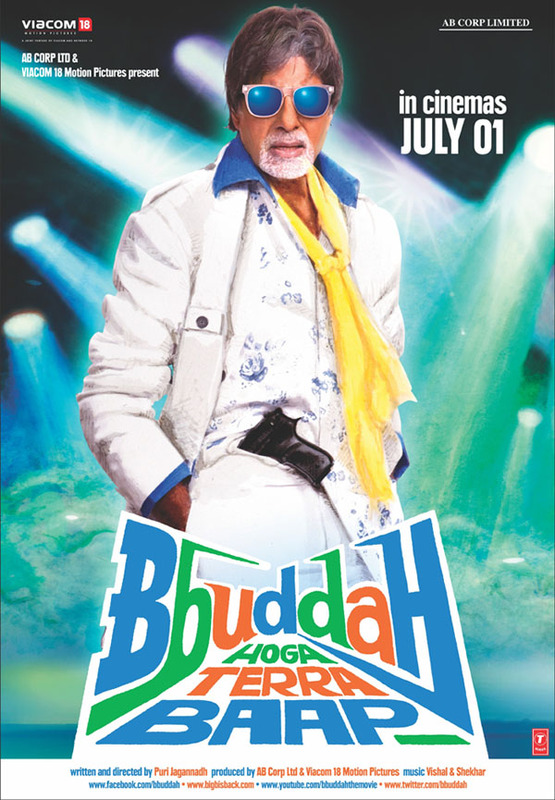 So let’s be very clear about this: Bbuddah… Hoga Terra Baap is an ode to Amitabh Bachchan. In purely artistic terms, there are plenty of holes I could pick in this film. But what’s endearing about it is that it’s not pretending to be anything but an out-and-out paean to The Bachchan’s Angry Young Man days, right from the name of the film’s official website http://www.bigbisback.com/ to the first scene in which AB enters the frame till the last shot which is followed by a note on screen by director Puri Jagannadh describing BHTBaap as his tribute to the megastar. The story is simple: Karan is a dashing young ACP in the Mumbai police force who earns the wrath of the gangster Kabir when he takes a public oath to rid the city of crime and criminals. Kabir wants Karan dead. Enter Viju, an elderly sharpshooter who had once left Mumbai to run a bar in Paris. Viju is a flashy sort who hates being called a bbuddah which, he points out, is quite natural: do bachchas like being called bachchas, he asks? Indeed. What follows is a two hour fun ride involving action, humour, song ‘n’ dance, repeated references to Bachchan’s earlier films and some all-round masti. Tribute #1: Viju, a cool curtailment I assume of Vijay, Bachchan’s name in several blockbusters. Tribute #2: Like Bachchan’s own personal life, this film is a recognition of the infinite possibilities that life offers you as an older person, which is something we in India tend not to see. Since we’re dousing ourselves in Bachchanalia here, of course there’s a Ma in the film: Karan’s mother played by the ever-beautiful Hema Malini. I tell you, AB and Hema can get sparks flying even today in a manner that would be the envy of many of their younger colleagues. Unlike Ready – another ode-to-a-superstar type of film that’s also in theatres right now – BHTBaap is almost never tacky with its Bachchan referencing, nor does it at any point get irritatingly repetitive. The credit for that goes to some clever writing by Jagannadh and his team whose citations of earlier AB films are not always literal. The film also cheekily turns typical 1970s-style dialoguebaazi on its head on occasion. Karan tells Viju on the phone: Saamne aa, tumhe itni goli maaroonga ki tum yaad rakhoge, or something to that effect. To which Viju replies: “Toh phir saamne kyun aaoonga, stupid?” Touche. The other reason why this film works is that though Bachchan’s Viju is the focal point of the story, other important characters too (namely the good cop and the bad guy) are given their due. Some of it doesn’t even make sense but it works all the same because of the self-deprecating tone. And when the film laughs at itself, it’s hard not to laugh along. So when Bachchan and a bevy of gori mems suddenly and inexplicably start dancing to Go Meera Go – a medley of songs from some of the actor’s biggest hits – a character asks the question: yeh Meera kaun hai? He doesn’t know. I don’t know either. But did we enjoy ourselves? That’s the entire point. Of the cast, Bachchan seems to be having a rollicking time. Sonu Sood as Karan is his usual reliable self (why doesn’t Bollywood give this guy bigger roles?) and god bless Jagannadh for that one scene in which the actor gets to display his finely sculpted torso! Hema Malini is elegance personified. Sonal Chauhan as Karan’s pretty girlfriend acquits herself well in the little time she has. Makrand Deshpande playing the lead villain’s flunkey is brilliant in a small role. But my pick of the cast is Prakash Raj who is hilarious and menacing by turns as Kabir. The final confrontation between Viju and Kabir is so well acted and well directed that I was beside myself with both tension and laughter. What I didn’t like … Well, there’s an extremely annoying sub-plot involving Raveena Tandon who seems to have been in love with Viju from her younger days. The deliberately over-the-top performance just doesn’t work. And since the actress doesn’t look a day above her 36 years, it’s weird to see her presented to us as the mother of a 20-plus-year-old daughter: someone sure as hell broke the law if she was married when that kid was born! It’s weirder still to hear Viju explain that there’s a 20 year age difference between them. Give us a break! The Bachchan’s a fit and fine hottie at almost 70, but what kind of mathematics is that?! It’s appropriate that Banda yeh bindass hai from the decade-old film Aks plays in one of their scenes together. That was the film which broke the dam of my tolerance for seeing Amitabh Bachchan acting with much-much-much-younger heroines when he played the husband of the amazingly smooth-skinned, then-20-something Nandita Das. Back to BHTBaap … Charmme as Raveena’s daughter plays the role in too fussy a fashion. And at several places, the scenes don’t flow smoothly from one to the next. But honestly, all the film’s flaws are redeemed by its unpretentious celebration of a remarkable career. Bachchan is enviably agile for a near-septuagenarian. And his voice works well for the songs he sings in this film, my favourite of the three being Haal-e-dil. Would Bbuddah… Hoga Terra Baap rank anywhere on a list of my 10 favourite Bachchan films? I’m afraid not. Because Sholay, Deewar and their ilk are way too slick to be compared to BHTBaap. But it’s certainly one of the better Bachchan films of the past half decade, a period that has done little justice to the man’s track record. And did I have fun watching it? I sure did! His contemporary actors already retired and are out of the screen. Mr. Bachchan is still performing as energetic as in his 70's. Certainly there are limitations on choice to act. We can not expect him, in this age, to act like Shahrukh, Salman, Aamir or Hritik. His acting in BHTP is superb. Congratulation Mr. Bachchan for your hard work and beautiful act as usual.